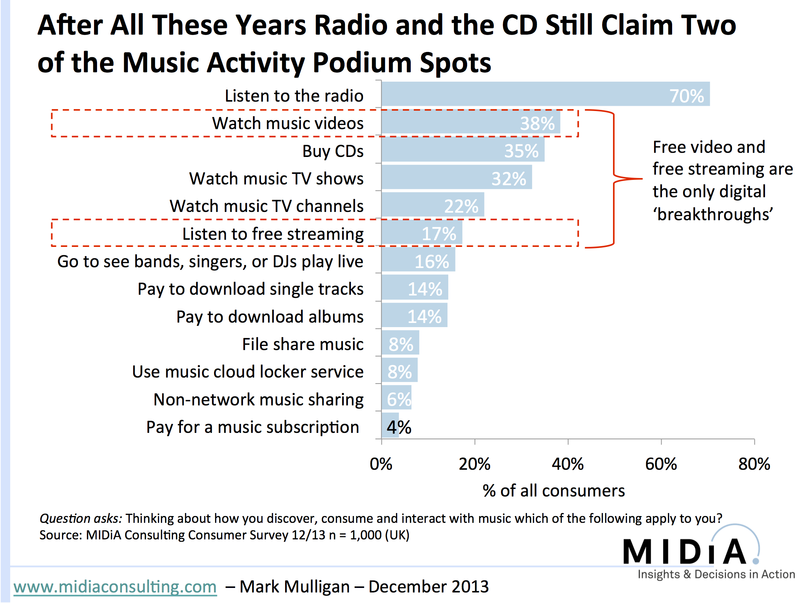 Today MIDiA Consulting published a report: Decoding the Digital Music Consumer. The report deep dives into the music activity of UK consumers leveraging data from a brand new MIDiA consumer survey. The music industry is in a peculiar spot: digital is where all the momentum is and yet it remains but a small part of the equation. Across the globe digital accounted for just 25% of recorded music revenues outside of the UK and US in 2012 but even in the UK, one of the most digital markets, traditional consumption modes still dominate (see figure one). 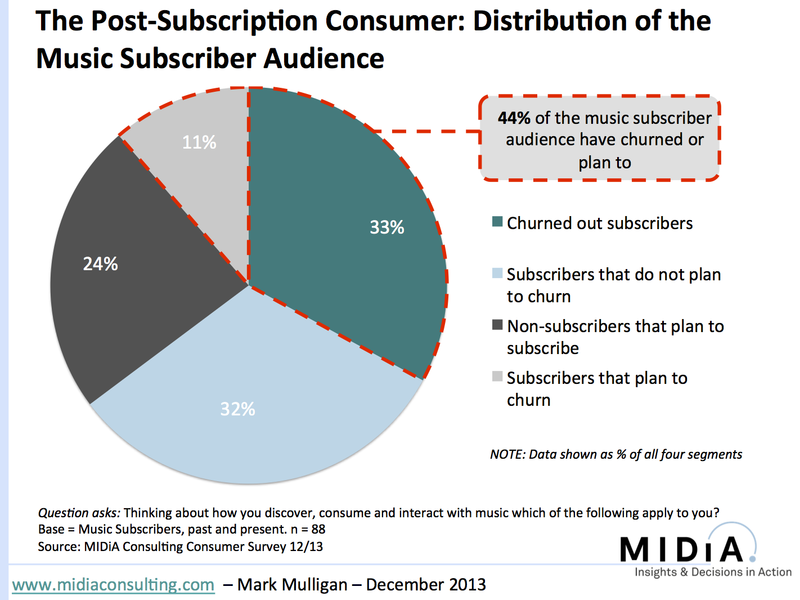 Churn from subscription services will become an increasingly important part of the digital music landscape (see figure two). Looking at the entire base of consumers that have either previously been subscribers, currently are subscribers or plan to become one, 44% have either already churned or plan to do so. Just 32% are current subscribers that intend to remain so. This base of churned music subscribers poses a key challenge for the digital marketplace: these consumers have tasted unlimited on-demand music without ads, on their phones, but are now going cold turkey. The question is where they will get their next fix? If it is not from subscribing to another service then the illegal sector beckons. This is the challenge that the music industry must meet over the next couple of years. It must ensure that these consumers either reengage with full fat music services or instead are nudged towards lower price point alternatives. This entry was posted in Ad Supported, Apple, Europe, Freemium, Music Strategy, Paid Content, Streaming, Subscriptions and tagged Free Report, iPlayer, MIDiA Consulting, Music Consumer Survey, Music Subscriptions, Music Survey, Spotify, Streaming, Streaming Music by Mark Mulligan. Bookmark the permalink. Wow Mark…it’s hard to believe how little the digital music activities has had in comparison to CDs on the market front. As much as I like my Vinyl records, tapes and CDs (in that sequence), I know downloading/streaming is the new business model. We know that train is coming, so I have to assume that it’s just a matter of time when things will favor digital over brick & mortar I.P. Or perhaps this “delay”, points to a new paradigm change – outliers that we just don’t understand yet because the technology is not there to support the infrastructure. Would love to download the report and have just subscribed to the blog, but there’s no embedded download link here. Are you able to post one? It’s going to be CDs and radio until you can listen to a stream in your car as easily as turning on the radio or popping a CD into the player (I don’t mean with adapters; I mean turn the knob and select a station). Same for your living room CD player.